1. From the experimental data obtained with each sample tested, report the alkalinity values and the concentration of each alkalinity species present (as mg/L of CaCO^). Why is distilled water considered to have no buffering capacity? Note: The P (Phenolphthalein) endpoint = pH 8.3, and the M (methyl orange or bromocresol green) endpoint = pH 4.5. 2. Observe the differences between the values of these samples and indicate what has influenced the composition of these samples. 3. Based on the experimental values of ANC obtained with the different samples, classify these samples according to their sensitivity to acid discharge. For this purpose, you must consider the largest volume of base added in order to raise the pH by one unit. Then, convert this volume into moles of base consumed per initial volume of buffer (considered in liters). B.2.b.2 Determine theoretically the btffering index of each of the buffers mentioned above. Include the pertinent graphs and calculations. B.2.b.4 Relate the differences in composition of the different buffers to the corresponding responses: pH, buffering capacity, buffering index. What do you conclude With respect to their differences and responses? 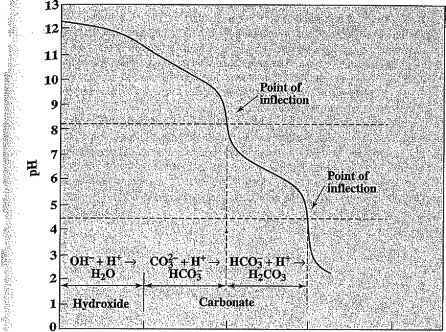 C.2.a How does the experimental pH value ofthe buffer SQlution that you prepared compare with the theoretical pH? Is there a deviation greater than 0.5 pH units? Why do you think this is so? C.2.b Determine experimentally the acid and base buffering capacity of your buffer solution: For this purpose, you must consider the largest volume of base added in order to raise the pH by one unit Then, convert this volume into moles of base consumed per initial volume of buffer (considered in liters). Considering the other buffers prepared in part B, how does yours compare in buffering capacity? C.2.b.2 Determine theoretically the buffering index of the prepared buffers. Include all the equations and calculations. C.2.b.3 Determine experimentally the buffering index of the prepared buffer. Include all the pertinent graphs and calculations. Was your prediction about the buffering index of your assigned solution correct?